Including raw images, features, and train/test partitions. More examples shown from Fig 10. The USAA dataset includes 8 different semantic class videos which are home videos of social occassions such e birthday party, graduation party,music performance, non-music performance, parade, wedding ceremony, wedding dance and wedding reception which feature activities of group of people. It contains around 100 videos for training and testing respectively. Each video is labeled by 69 attributes. The 69 attributes can be broken down into five broad classes: actions, objects, scenes, sounds, and camera movement. It can be used for evaluating approaches for video classification, N-shot and zero-shot learning, multi-task learning, attribute/concept-annotation, attribute/concepts-modality prediction, suprising attributes/concepts discovery, and latent-attribute(concepts) discovery etc. The ontology attribute definitions of these 8 classes are from their wikipedia definitions; and can be downloaded from here. Xtest: the low level features of testing video data. Also note that there are several videos of all 0 low-level features (<5) due to some problems of extracting process. The low-level features are soft-weighted. test_attr: the user-defined 69 binary video attributes for testing videos. To repeat the Zero-shot learning results of USAA in our PAMI paper, we are using the following settings: We use three splits for ZSL, and the zero-shot (testing classes) are [1,2,4,7];[1,6,7,8],[2,4,5,6]; Since we provide instance-level for each video, the binary class-level prototype should be mean(attribute(video==classname,:))>Threshold; i.e. the mean of the video attributes belong to the same class; And the threshold=0.5. 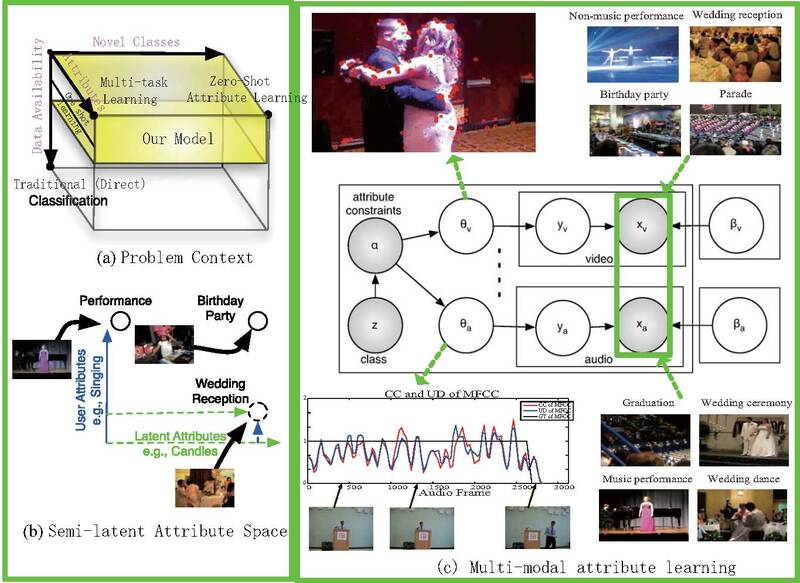 Yu-Gang Jiang, Jun Yang, Chong-Wah Ngo, Alexander G. Hauptmann,Representations of Keypoint-Based Semantic Concept Detection: A Comprehensive Study [pdf] [bibtex] [project page] IEEE Transactions on Multimedia, vol. 12, issue 1, pp. 42-53, 2010. Yu-Gang Jiang, Guangnan Ye, Shih-Fu Chang, Daniel Ellis, Alexander C. Loui, Consumer Video Understanding: A Benchmark Database and An Evaluation of Human and Machine Performance, ACM International Conference on Multimedia Retrieval (ICMR), Trento, Italy, Apr. 2011.